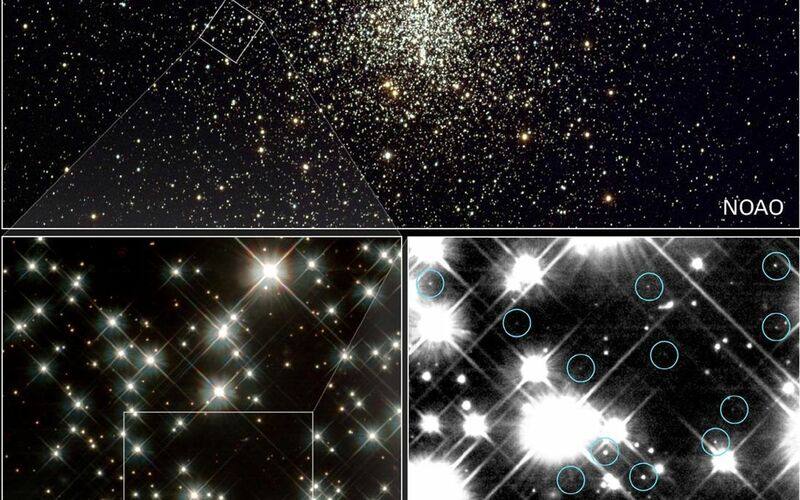 Peering deep inside a cluster of several hundred thousand stars, NASA's Hubble Space Telescope has uncovered the oldest burned-out stars in our Milky Way Galaxy, giving astronomers a fresh reading on the age of the universe. 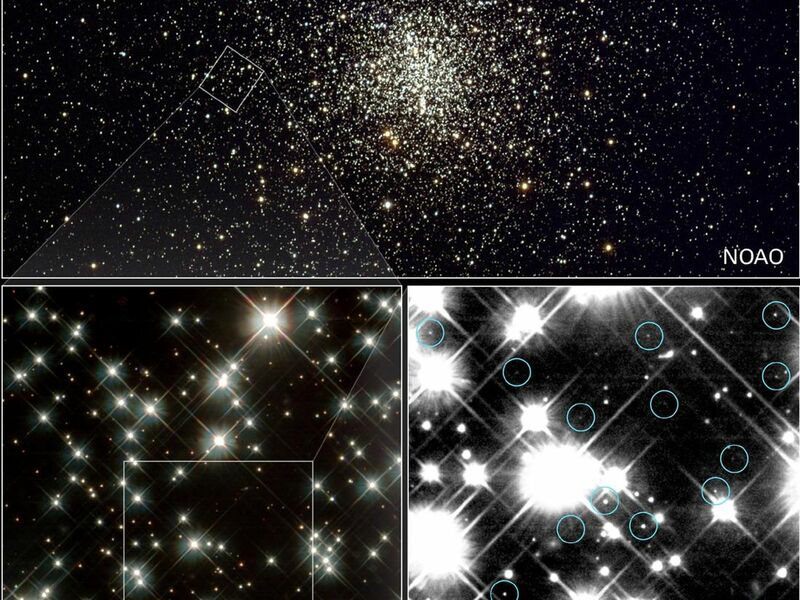 Located in the globular cluster M4, these small, burned-out stars -- called white dwarfs -- are about 12 to 13 billion years old. By adding the one billion years it took the cluster to form after the Big Bang, astronomers found that the age of the white dwarfs agrees with previous estimates that the universe is 13 to 14 billion years old. The images, including some taken by Hubble's Wide Field and Planetary Camera 2, are available online at http://hubblesite.org/newscenter/archive/releases/2002/10/image/a/. The camera was designed and built by NASA's Jet Propulsion Laboratory, Pasadena, Calif. In the top panel, a ground-based observatory snapped a panoramic view of the entire cluster, which contains several hundred thousand stars within a volume of 10 to 30 light-years across. The Kitt Peak National Observatory's .9-meter telescope took this picture in March 1995. The box at left indicates the region observed by the Hubble telescope. The Hubble telescope studied a small region of the cluster. A section of that region is seen in the picture at bottom left. A sampling of an even smaller region is shown at bottom right. This region is only about one light-year across. In this smaller region, Hubble pinpointed a number of faint white dwarfs. The blue circles indicate the dwarfs. It took nearly eight days of exposure time over a 67-day period to find these extremely faint stars. 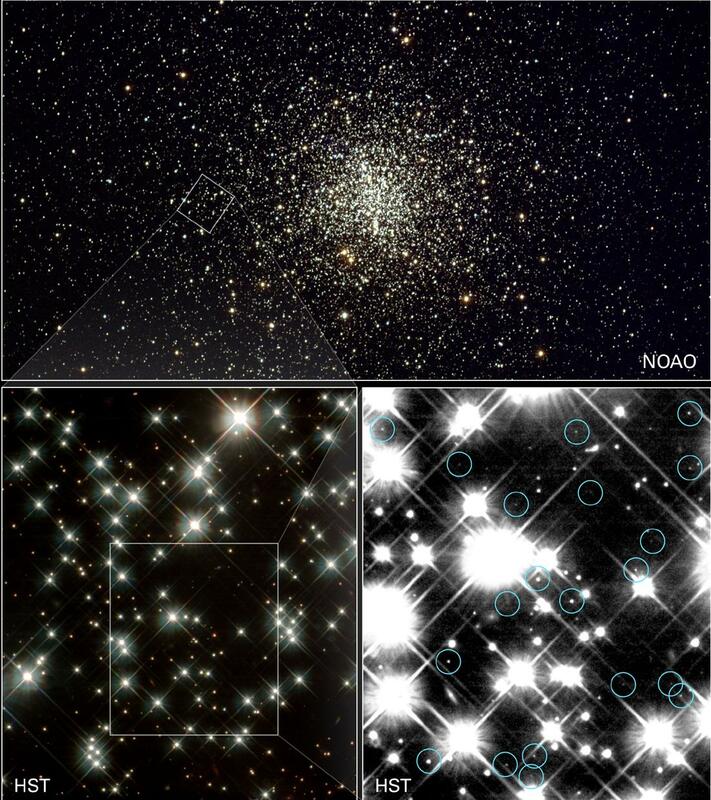 Globular clusters are among the oldest clusters of stars in the universe. 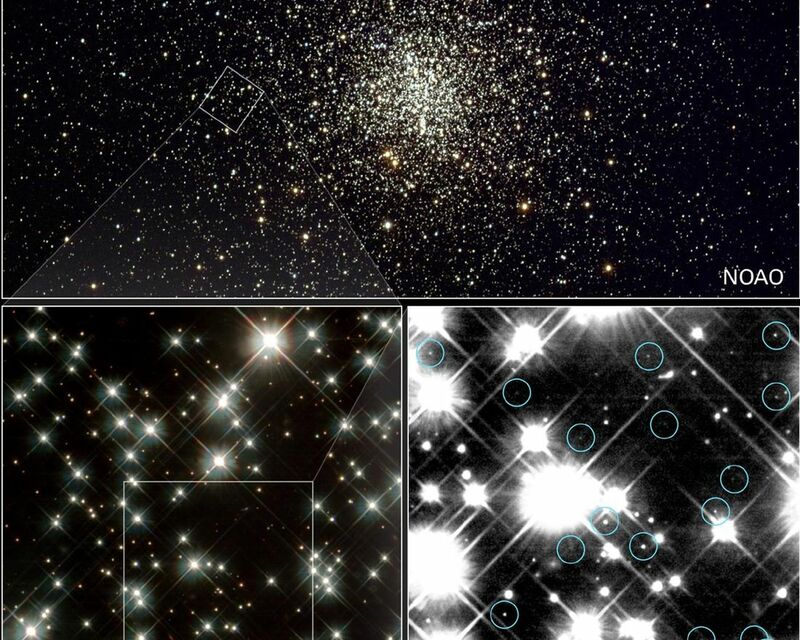 The faintest and coolest white dwarfs within globular clusters can yield a globular cluster's age. Earlier Hubble observations showed that the first stars formed less than 1 billion years after the universe's birth in the big bang. So, finding the oldest stars puts astronomers within arm's reach of the universe's age. Hubble's Wide Field and Planetary Camera 2 made the observations from January through April 2001. These optical observations were combined to create the above images. Spectral data were also taken. M4 is 7,000 light-years away in the constellation Scorpius. The full press release on the latest findings is online at http://oposite.stsci.edu/pubinfo/pr/2002/10/pr.html. The Space Telescope Science Institute is operated by the Association of Universities for Research in Astronomy, Inc., for NASA under contract with the Goddard Space Flight Center, Greenbelt, Md. The Hubble Space Telescope is a project of international cooperation between the European Space Agency and NASA. The California Institute of Technology in Pasadena manages JPL for NASA.